The Directorate of Research is coordinating and monitoring the research activities of the faculty of Tamil Nadu Fisheries University, Nagapattinam. The Directorate has linkages with the State and Central Fisheries Research Institutes for the exchange of research innovations in fisheries. Further, the overall research of Tamil Nadu Fisheries University has been reviewed periodically and necessary guidelines issued. The Director of Research is administering the research activities of the faculty of Tamil Nadu Fisheries University. The Directorate is also coordinating with the Central and State Fisheries Institutions for various fisheries programmes. In order to assist in the administration of ministerial works of the Directorate, the requirement of the office staff is justified. 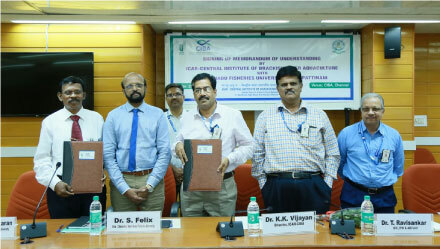 To coordinate the research activities of the faculty of Tamil Nadu Fisheries University. To collaborate and cooperate with Tamil Nadu State Fisheries Department, Tamil Nadu State Fisheries Development Corporation, etc. To disseminate the salient research findings through the mass media, audio visual aids, etc., for the benefits of the farming community.